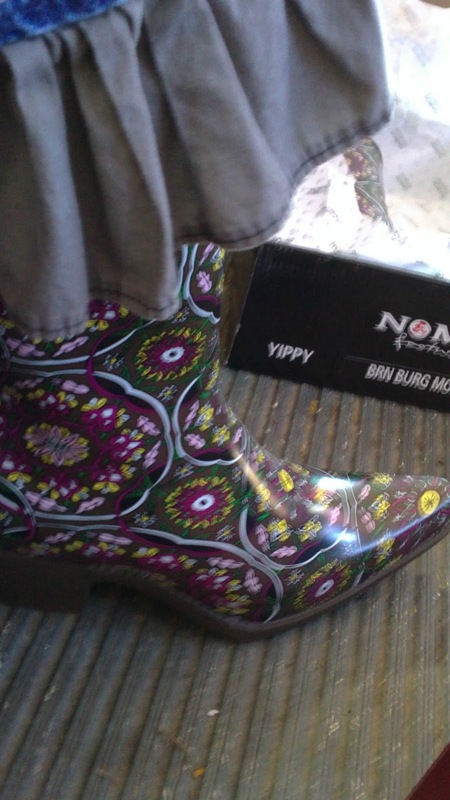 Hope's Cafe: SFF-Nomad Rain Boots-Review and Giveaway!! Nomad has certainly made a great product with these rain boots. A high quality boot with a very stylish look, at a very reasonable price! "In 1997, two shoe salesmen wandered from city to city, store to store, inspired by an idea that would transcend into something they never thought imaginable. Their dream was to build a brand that would represent the free-spirited individual; the individual who followed trends and appreciated fashion, but never forgot who they truly were. Hence, Nomad was born; representative of their own ideals, as well as the nomadic attitude that lives within each “nomad” girl. Being one of the pioneers of the high EVA foam sandal, Nomad Footwear journeyed from the junior fashion market, making its mark in the shoe industry. Since then, Nomad Footwear has transformed its styles to shoes like the Cork Wedge, creating styles that could be worn by any girl, day or night. Nomad is giving a pair of shoes (winner's choice up to $55.00 value) to one of my readers!! Go to Nomad Footwear and tell me what pair of shoes/boots you like best! 1 entry-"Like" Nomad Footwear on Facebook; tell them what shoes/boots you like best, and that you came from Hope's Cafe! 1 entry-Follow Nomad Footwear on Twitter. This giveaway ends Tuesday, March 1, 2011, at 11:59 p.m. Please leave a valid email address in each comment, as this is how the winner will be notified. Winner will have 48 hours to respond, or another winner will be chosen. Giveaway open to US residents only. Disclaimer:I was not monetarily compensated in any way for this post. All thoughts and opinions are mine. All quotes taken from the Nomad Footwear website. I really like the Boots - Wayne in Camel. I love the boots - Puddles black/white plaid. i love the black alaska boots! wow what a great place to shop. I love the Wayne Camel boots, also all the rainboots. P.S. I've tried to add your rss feed a few times and it doesn't work on my Yahoo reader. I like the Alaska in Black and the Wayne in Black. Love their boots! Please enter me. Thanks! I like the Puddles- Red Flower Fields boots. First....you have an awesome blog here! Second...I've recently blogged about my PASSIONATE desire for rainboots. Third....I really want the Puddles Leopard Tan rainboots for $50! I love so many but the Harness - Brown/Plaid were calling my name! I've never seen such awesome rainboots before! I was also totally digging the Brown Plaid Streets and Natural Swingsets. I can't decide which I love more! I like the Puddles Boots in Black Paisley. I like the Puddles - Green Victorian Rain Boots! Added the Spring Fashion Fling button to my favorite blogs page. I love the PUddles -- Blue Raindrops boots. I haven't heard back from you....so I'm sending a message just in case. I emailed you back about winning!